There’s no separating the land and people of the border region. Este artículo también está disponible en Español aquí. On the seventh day of his presidency, Donald Trump had a series of phone conversations with world leaders, as is standard for an incoming head of state. At 9:35 that morning, he sat inside the Oval Office with Mexican President Enrique Peña Nieto at the other end of a telephone line. “I would appeal to you, Mr. President, for us to allow room to look for a new solution between our two countries,” said Peña Nieto via an interpreter. Their relationship was already rocky, due in no small part to Trump’s offensive comments about Mexicans on the campaign trail. After a couple of minutes of polite back-and-forth, Trump pled with Mexico’s president: Stop saying Mexico won’t pay for the border wall. 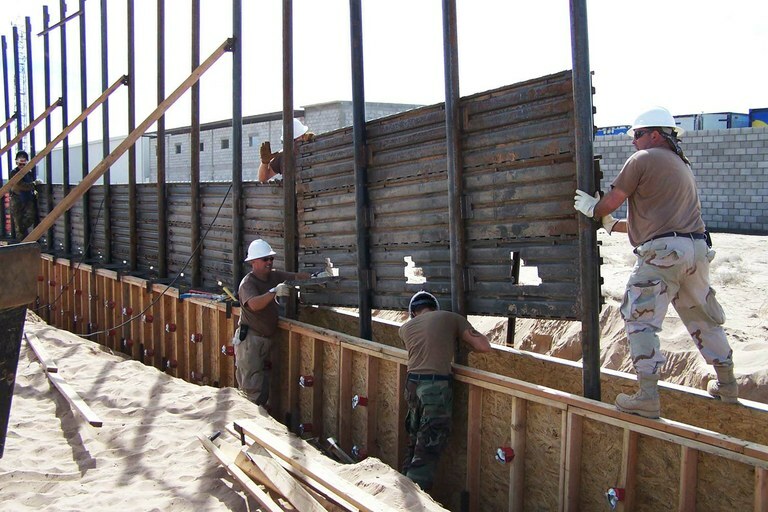 U.S. Air Force airmen install a fence along the U.S.-Mexico border east of San Luis, Arizona in 2006. Although there are significant natural and manmade barriers along the U.S.-Mexico border, the current administration is looking into constructing more wall to separate the countries. “They (the press) are going to say, ‘Who is going to pay for the wall, Mr. President?’ to both of us, and we should both say, ‘We will work it out.’ It will work out in the formula somehow. As opposed to you saying, ‘We will not pay’ and me saying, ‘We will not pay’,” Trump said. The phone call would last almost an hour, with the matter left unsettled. Since 2004, I’ve been reporting on the Southwestern border from Central Texas to Southern California, with a particular interest on the ways in which the flow of culture, goods and ideas has overridden the manmade territorial division. The wall itself is a boondoggle. It is no barrier to the criminal networks which, often by bribing border officials at regular checkpoints, smuggle human beings inside car trunks at $15,000 a head (or inside trucks, like the one that was found with dozens of bodies inside in San Antonio, Texas). The Department of Homeland Security has estimated a new wall could cost about $21.6 billion, not including maintenance; Senate Democrats estimate the initial price to be as high as $70 billion. Unsurprisingly, our southern neighbor has refused to fulfill Trump’s order. Almost 700 miles of different kinds of fencing already exist along the 2,000-mile border, much of it built during Barack Obama’s presidency; law enforcement along the border has increased. Migrants and drugs can still be smuggled across but under increasingly dangerous circumstances. Despite the obstacles, the border region refuses to be cleanly divided: The San Ysidro-Tijuana border crossing in California, for instance, is the world’s busiest: It’s an entry point to a binational region with a gross annual product of more than $220 billion, according to data from UC San Diego’s Center for U.S.-Mexican Studies. Every day, it is traversed by approximately 63,000 pedestrians, 120,000 passenger vehicles and 6,000 trucks. These border crossers include Mexican day laborers who return home at dark, young people who commute for hours to attend college in San Diego, American citizens visiting family members in Mexico, small business owners stocking up on cheaper priced goods south of the border and American retirees living in Baja California, Mexico, coming back home for a spell. Far from simply a “city of sin” and a home to powerful drug cartels, Tijuana is a thriving urban area, a manufacturing hub for companies like Panasonic, Samsung and Sony, and a place of social experimentation. Over the past decade, Tijuana and San Diego have bet on greater cooperation through projects aimed at economic development for people on both sides of the border. In 2015, the Cross Border Xpress, a terminal connecting San Diego to the Tijuana airport opened its doors. By 2021, investors in the two cities hope to unveil a new port of entry co-managed by local governments on either side of the border. Since 2012, Forman and her co-director, urbanist Teddy Cruz, have collaborated with various grassroots efforts to encourage otherwise difficult transnational exchanges of ideas. Their so-called “community stations” — pilots for new crossborder collaborations — have yielded greater civic engagement and new urban planning policies that democratized the use of new technologies to assess soil, air and water quality in neighborhoods on either side of the border. The prospect of an even bigger law enforcement presence at the border (and a seemingly uglier, thicker and costly wall) threatens to make such partnerships more difficult. “There is obviously a lot of fear and uncertainty in the border communities in which we work,” Forman told me. But the current wave of fear-mongering that’s originating at the White House has only emboldened Forman and her partners as they try to scale up their experiments in binational cooperation. Here’s one persistent problem that antagonistic border policies can’t fix: the wastewater from Tijuana’s informal settlements that is flowing into San Diego’s estuaries and water reserves. The need for cross-border municipal water planning is urgent, requiring urban policy and equitable economic and environmental development collaboration across multiple U.S. and Mexican agencies. Wastewater, it turns out, is much like trade or human relationships: It cannot be separated at the border, not even with a brand new barrier.